ASI Industries Limited is in portfolio of Subramanian P. He is one of the top investors in India. Associated Stones is the largest stone mining Company in the World. It is the only listed player in India in this sector as of now. 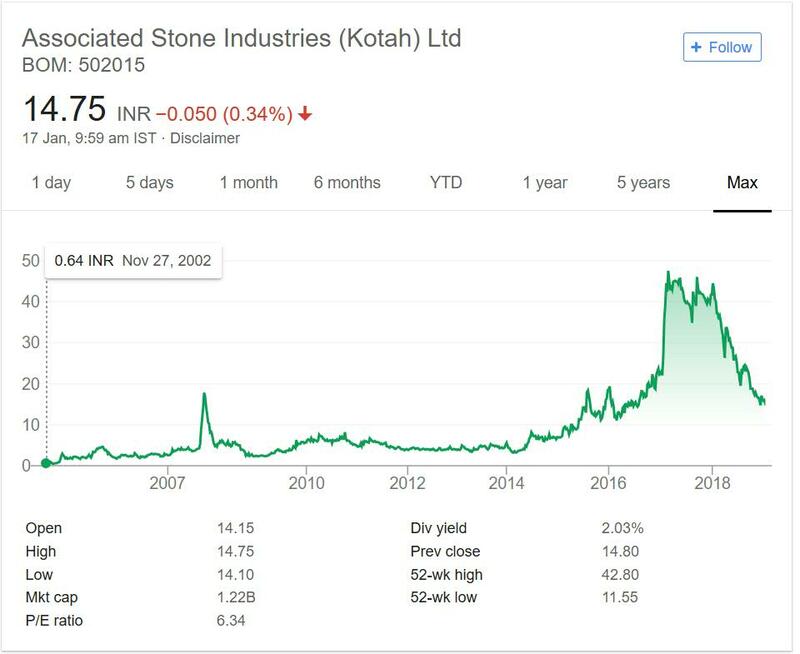 As per the Company website it holds the largest stone mining quarry in the world spread across 10 sq kms at Ramganjmandi, Rajasthan which is the home of impeccable quality Kota Stone. The quarry produces over 12 million square meters of Kota Stone every year . The total wind power capacity is 3.625 MW. The Solar power initiatives are still in early stages. But Company has given indications that Solar power will be part of its key decision making in near future. The natural stones segment is key revenue generator for the Company. The power part is just supplementary part of it.The natural stones are carved into tiles and Slabs. Now lets look at performance of this company over the years.As per Dow theory of technical analysis price performance over a period of time reflects Company state. The company was trading close to less than a rupee in year 2002. Over next five years it has gradual movement upwards. But in year 2008 it had huge spike in value followed by crush down due to global crisis. Next 8 years went into consolidation. The price never went past the high it made in year 2007. It was gradual movement up and down over these years. After these long consolidation years the Company went past 40 marks in the bull run after year 2014. It crushed to 10 levels after the juggernaut movement . Based on the price performance Company does look attractive. It is still a very small player and has potential to grow big. If you look 16 years performance then Company has made more than 10 times money for the investors. It also gives 2% dividend regularly. Tiles and Slabs are becoming more popular with time.It is hard to think of a kitchen without Slabs. The concrete structures are giving way to tiles in major way. There is a shift in housing sector. The shift is very clear everywhere from rural to urban areas. The demand for natural stones will continue to grow. It is becoming fashion trend now. People are more inclined to use tiles and slabs in their construction. It will drive the growth in near future. The natural stone sector is still very much unorganized and people do not ever think of using any brand for that matter. ASI Industries being owner of largest mine in World will have upper hand.Any growth in the sector will help it grow. So the company is small in size , it has monopoly position, sector is largely unorganized and it has performed well in past. The sector wil grow in future due to growth in demand. All these factors will help the Company and make it good choice for investment tracking. You can track the company by adding it to your stock watch list. It has performed well in past and has potential to do good in future. Note as of this writing I have added this Company in my stock watch list. It sound promising company to me and I will track it closely.